White River Credit Union isn’t owned by a bunch of Wall Street fat cats or distant overlords. We’re owned by our members – our neighbors right here on the Plateau. So instead of stuffed shirts, we wear t-shirts. Or ugly sweaters on Ugly Sweater Day. Or dress like pirates for Talk Like a Pirate Day. Did somebody say, “parade?” We’re there! We LOVE to immerse ourselves in our community with pizazz and always keep it quirky and fun. At White River CU, providing top-notch service to our members has been our number one priority for over 66 years. That’s why we need enthusiastic team members that live and breath our core values. We have an opportunity for you to join our team as an Account Specialist. Our Account Specialists enjoy channeling their inner Sherlock Holmes by investigating solutions to problems. We are looking for a candidate with loads of relatable life/work experience to add to our amazing team. You’re always on top of it. Rarely does anyone tell you what needs to be done. People are always telling you how personable and positive you are! This is a part-time opportunity (20-29 hrs/wk) requiring Monday-Saturday availability. Compensation is $14/hr. Employment contingent upon a background screen. 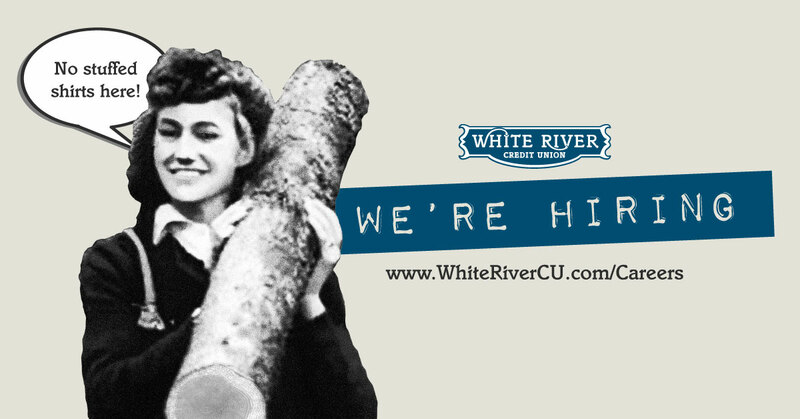 Please send application and resume via email to Careers@WhiteRiverCU.com or mail to White River Credit Union Careers, Attn: Sadie, PO Box 35, Enumclaw, WA 98022. Applications available at White River Credit Union, at whiterivercu.com/careers, or via email request.